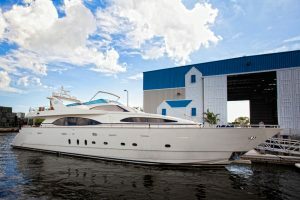 100 Azimut Jumbo 2005 Used Motor Yacht for Sale : Atlantic Yacht & Ship, Inc.
100 Azimut Jumbo 2005 – New Offering! Joe Marino just listed DANIELA, the 100 Azimut Jumbo 2005! Azimut is the leading European builder of yachts and megayachts. In fact, this 2005 Azimut 100’ Jumbo is one of the last models of the popular Jumbo Series. The 100 Azimut Jumbo 2005 features the rare country kitchen. The Country Kitchen was adapted for the USA market after repeated requests from American buyers. The arrangement allows for an open galley with family style casual dining space. Like many homes, the kitchen area becomes a popular gathering space. This 100 Jumbo Azimut features 4 luxuriously appointed staterooms with ensuite in all staterooms. Guests enjoy privacy and the sensation of a much larger yacht. Additionally, the roomy beam is 21.7′. To top off her features, she has an enormous flybridge with Jacuzzi. The 100 Azimut Jumbo 2005 is powered by MTU 16V2000 M91 diesels producing a cruising speed of 22Kts. This Jumbo Azimut is one of the most popular Azimuts in the 100 foot plus range. The 100 Jumbo does not disappoint. Whether cruising the Bahamas or the Florida Keys, this Jumbo has the range and draft to get you into the most remote areas in 5 star comfort. Azimut has enjoyed a fantastic production run from 1996-2005 with dozens of Jumbo’s cruising around the world. Italian styling and pedigree plus ultra-reliable German engines make the Jumbo a natural fit for any yachtsman moving up from a 80-90’ motor yacht. Daniela is located in North Miami Beach and is easy to see by appointment. Contact Joe Marino, Central Agent, for showings at 954-328-2059 or joe@ayssales.com. For over 56 years Atlantic Yacht & Ship has been serving the yachting community. Our headquarter sales office is dockside at Harbour Towne Marina. In the heart of the yachting capital of the world, Fort Lauderdale, FL. Atlantic Yacht and Ship, Inc. is your one stop resource for purchasing or selling a quality vessel. We provide the highest quality service and sales in the yachting industry today. Regardless if you are looking at yachts for sale, or thinking about selling your yacht. It is always wise to have an experienced broker representing your interests throughout the deal.